Product #17322 | SKU GTV-COMPSVID-2-HDMIS | 0.0 (no ratings yet) Thanks for your rating! The GefenTV Composite to HDMI Scaler from Gefen allows you to upscale composite video or S-video input to digital HDMI video output. Audio output can be embedded with the HDMI signal or separate. It supports resolutions of up to 1080p or 1920 x 1200. Input resolution is automatically detected and output resolution is selectable. 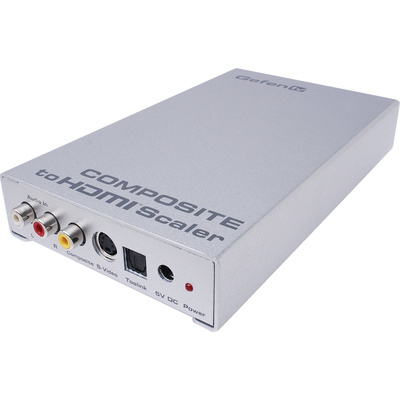 Use this device to scale composite video or S-video to HDMI. Audio output can be embedded with the HDMI signal or managed separately. This device supports resolutions up to 1080p or 1920 x 1200. Input resolution is automatically detected and output resolution is selectable.